Key stat: The Rams’ defense, led by its defensive line, forced 109 negative plays in 2016, second-most in the NFL. Since the start of 2015, the Rams have forced an NFL-leading 241 negative plays. In the seven games Donald, Quinn, Hayes and Brockers all started together, the Rams averaged more than seven tackles for loss and more than six quarterback hits. This, actually, is a position of strength, largely because of Donald, who might be the game’s greatest defensive player, regardless of position. Donald has been named Pro Football Focus’ defensive player of the year twice in a row and has made the Pro Bowl in all three of his NFL seasons. In 2016, he led the NFL with 31 quarterback hits and tied for the lead with 17 tackles for loss. The key question here is Quinn, both because of his recent health and the system that will be implemented. Quinn racked up 40 sacks from 2012 to ’14, third-most in the NFL, but has started only 15 of the Rams’ 32 games over the last two years. The Rams have hired long-time, well-respected defensive coordinator Wade Phillips, who will implement what he calls a “hybrid” 3-4 scheme. Quinn may convert to an outside linebacker, but Phillips stressed that “guys who can rush are going to rush.” That, of course, includes Quinn. All four of the Rams’ starters — Donald, Quinn, Brockers and Hayes — are locked up for at least two more years, so they’re in good shape. But as many as four of their backups can become free agents, so the Rams have to replenish some depth. 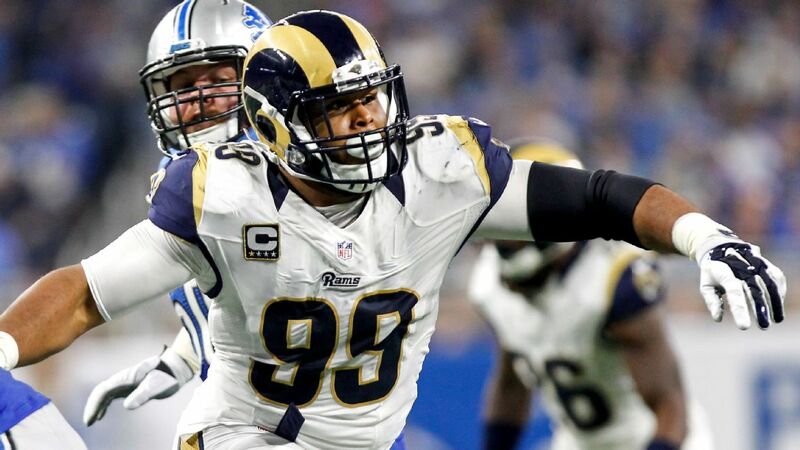 Eight Rams defensive linemen took more than 350 snaps last season.